CP: If you had the opportunity for an interview with God, what are three things you'd ask? Powell: What breaks your heart? Outside of humans, what part of creation are you most proud of? If Christ's death was enough for salvation, why is our belief in Christ necessary? CP: What would you say is the significance of showing the audience Paul's inner battle with God? Powell: I think it reminds the audience that at one point or another, many of us will have an inner struggle with God. I hope this will encourage empathy for each other. CP: Paul was a Christian but didn't know how to talk to God. What was the message behind exploring that in the movie? Powell: Many Christians, including myself, are very busy and forget that the two ingredients needed for a conversation are talking and listening. With all of the distractions around us and at our fingertips, it is difficult to remember to listen. We see this play out in Paul's life and it's a good reminder for the rest of us. 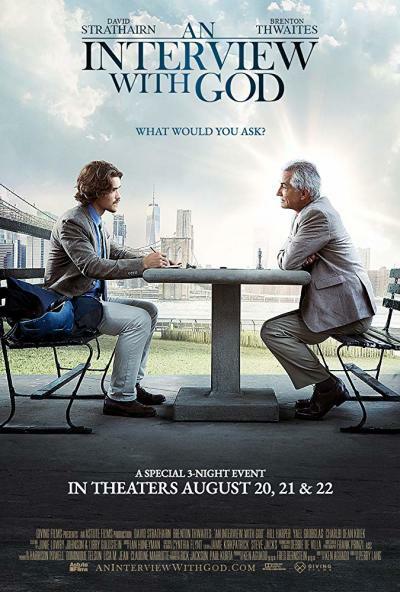 CP: What was it about actor David Russell Strathairn that secured him for the role of God? Powell: David is a brilliant actor! Not only can he memorize 20 pages of dialogue, but he feels approachable and yet mysterious, witty and yet serious. A great mix. CP: Did anyone from the cast share a personal testimony from something they took away from their experience on set? Powell: I think many of the cast felt more comfortable talking about faith and questions they would ask God, regardless of where they are on the spiritual spectrum. CP: We know Giving Films supports several charitable organizations. Which organization will benefit from the movie? Powell: As our funder grew up in foster care, we donate our profits to charities making a difference in the lives of children. This includes FaithBirdge, Children's Alliance For Orphans and Sunshine on a Ranney Day. CP: What are you hoping people take away from "An Interview With God"? Powell: I hope people will leave realizing that God loves them, and because of that, there is no question that is off-limits or question that He can't handle or that in the asking, could ever change His love for us. I want people to feel empowered to share and discuss the tough questions in life. For more information on "An Interview With God," visit the website.